Can you picture me every time I'm in any store? I'm the one with the far off look on my face, deep in thought. I walk very slowly and look closely at every item. When I'm shopping...I'm thinking Tool Time!! 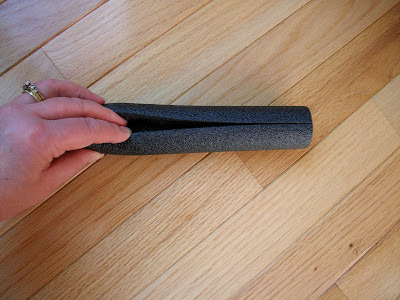 When I saw these polyethylene pipe insulation tubes (first picture below), I knew one day they would be a blog post. What is polyethylene...it's a foam that they use for everything from cushioning items in packing, to insulating pipe, to pool noodles. They use it for everything. 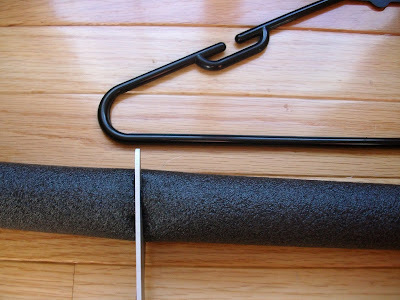 Today, I will be using the foam tubing they use to insulate plumbing pipes. It keeps the pipes from freezing. They are in hardware stores and I even found this one in a discount store. They are cheap, cheap! I paid 95 cents for this piece. They usually come in 6 foot length and are hollowed out in the center usually sized in the diameter of the pipe. I have seen 1/2 inch and 3/4 inch size. They also have a pre cut slice down one side to easily wrap around the pipe. I think it's best to go with the 1/2 inch. The measurement is for the pipe that goes inside the hollow center. Ok, enough of the description...onto today's project. 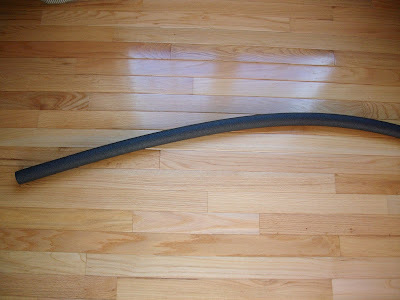 Here's the 6 foot length of insulation tubing. This is the pre cut slit on one side. 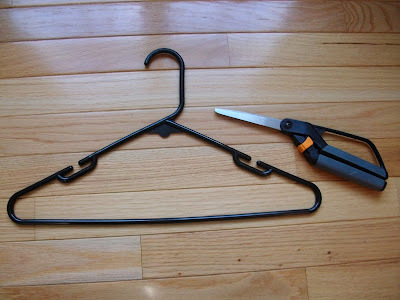 For this Tool time, all you will need is a coat hanger and scissors. Measure the tubing up to your coat hanger. 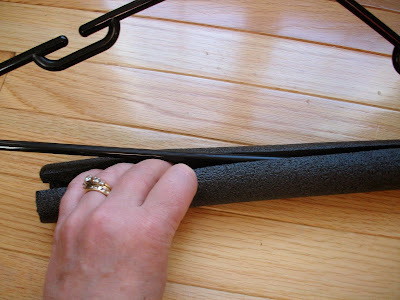 Depending on the hanger size, you can probably cut 5 pieces from the tubing. The tubing cuts very easily with scissors. just slip in your coat hanger. 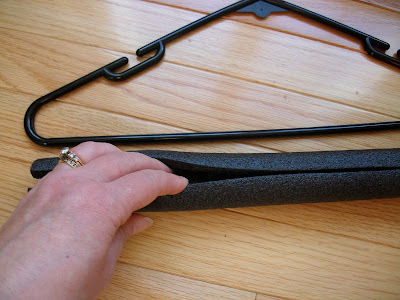 Once you start to use your hangers (examples below), you may need a spot of hot glue so the tubing won't spin on the hanger once the item is on it. spaceNow, here you have it. 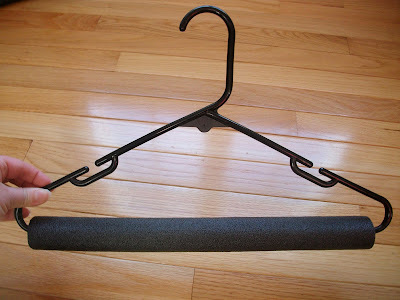 A covered coat hanger that prevents the dreaded (maybe only dreaded to me though) coat hanger crease! Don't think I'm nuts, but I hate those crease marks. spaceHere is the first example of how it can help. My husband's suit pants will no longer have that wrinkled line across the knee that I have to iron out whenever he wears them. The roundness of the tubing keeps the pants smooth. 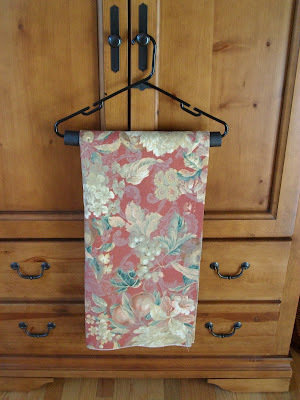 I also like it for my table cloths. I'll have my Thanksgiving table cloths all ready to go when I need them and no lines every where. The last idea might be the best for quilters. 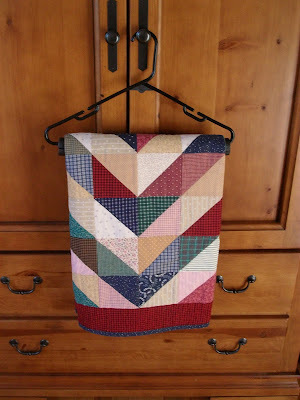 Do you have seasonal quilts that you store a way when not in use. Well, to keep those unwanted fold lines away, just hang your quilts on the tubing!!! This is really great for wall hangings too. The way I figure it, one plastic coat hanger is under 10 cents a piece, because you buy them by the bunch. The tubing is mostly under $1.00, so each section is about 20 cents. So for a total of 30 cents, you have something like those expensive trouser hangers. Even those trouser hangers still give you the "Dreaded Crease"...say crease with an echo...it has more drama than just a post about a hanger!! Great idea - the quilts could be popped away in a wardrobe out of the light. In a lot of sunny places in Australia, the light fades the fabric, so I guess it is the same there! You are my hero! I have a boxer pup that is about 6 months old and loves to chew small cords. One of her tasty morsels was the cord to my Bernina foot!Thirty something dollars and a long trip to my dealer and it is fixed. This would be perfect! It fits over a cord,anything else I thought of would not fit over the plug. And it makes it too big to interest her. Thank you!!!! Great idea - I'll never have creased lines again!! Thanks! I'm off to Home Depot! Another great idea! It is very good and I too dont like that crease...after spending heaps of time making sure its creaseless there is nothing worse than finding it there when you go to wear them. GREAT idea! (Now...do you think we can get them to make the foam in pretty colors for us?? LOL) I know...I know...the foam is mostly covered when something is hung on the hangers. What a neat idea, I am going to get some of that. I will get less creases on the quilt and on the pants or linens. I used the foam to wind my binding. It works really well as you can start at the cut and it stays there! You can also pinch the end at the cut, too. Thank you for thinking outside the box! Cool! You never cease to amaze me with your useful ideas! Thanks! This is another terrific idea! Thanks so much for sharing! What an innovative idea!! Thanks for sharing! Karen, said in the words of a "fair dinkum" Aussie... YOU're AWESOME!!! I love the way your mind works, you are ingenious! You never cease to amaze me with your creativity! You are one smart cookie!! Okay Karen - this is a top-notch idea!! I love it and will be off to the hardware section tomorrow!! I'm just loving all those I-spy fabrics - what a fun swap! I was just at Home Depot this weekend but now I better make another trip to make these. I usually use cardboard rolls from wrapping paper but if the item is heavy they tend to sag in the middle a bit but this is an even better idea. Thanks for sharing. I posted some quilts from a show last month that you may like to view on my blog. I've often thought to myself while I'm in Lowe's or Home Depot....do I look like Karen....can I help find her something here...too funny. Can't even go into those places without thinking YOU!!! Hi I just found your blog thru Mel's Own Place , and I am in LOVE!!! your tool tuesdays are brilliant! Ok, now the guy you live with who sometimes thinks you are bonkers, surely must realize that there is a genius in that head of yours! 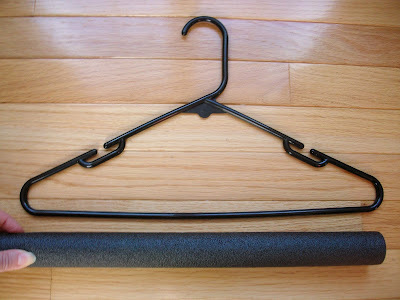 A variation of this would be to put the tube on the angle parts of the hanger and then you can hang sweaters, etc without getting the weird hanger crease. I am sure that I have an extra bit of fabric around here to wrap the tubing to make it look pretty and perhaps a bit of lavender to make it smell good! This is a fantstic one! Thanks for sharing. Putting it on my list right now. They were designed by a retired Soldier and are manufactured in Grapeland, Tx. I love it I'm on my way to the hardware store to pick up supplies for a couple of your tips. I like to use SWIM noodles for the larger size (I use it for delicate knits) and so I can get those pretty colors. The center hole is rather large and makes it particularly prone to spinning(I've juryrigged them for now.) Probably the hole is big enough to tuck this smaller tubing inside...that with the spot of glue might be just the ticket. Thanks! 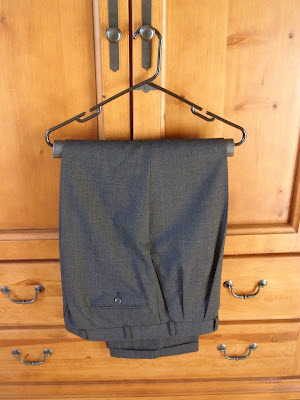 Pants hanger - brilliant idea!